The Redmi 6, 6A and 6 Pro are all familiar phones launched back in June, but it's only now that they are reaching the Indian shores. 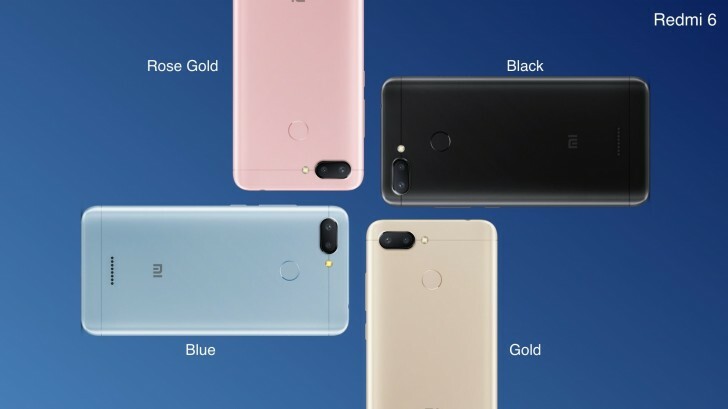 Starting with the vanilla version, the Redmi 6 offers a substantial upgrade over its predecessor by adopting a faster chipset - Helio P22 and more storage - 3GB/32GB or 3GB/64GB whereas the display shrinks a little from last year - 5.45-inch HD+. Now instead of one, the Redmi 6 gets two cameras on the back for those blurred background portrait shots. The setup has 12MP + 5MP sensors. The phone runs on a 3,000 mAh battery charge that Xiaomi says will last a full day, and ships with Android 8.1 Oreo out of the box coupled with MIUI 9.6. The Redmi 6 Pro takes things up a notch, literally and figuratively speaking. It adopts a 5.84-inch display with 1080 x 2280 pixels resolution, tall 19:9 aspect ratio and a notch that can be hidden by flipping a software switch in the resettings menu. Since it has a "Pro" in its name, it has a considerably more powerful chipset - Snapdragon 625. It also comes in 3GB/32GB and 4GB/64GB memory versions. 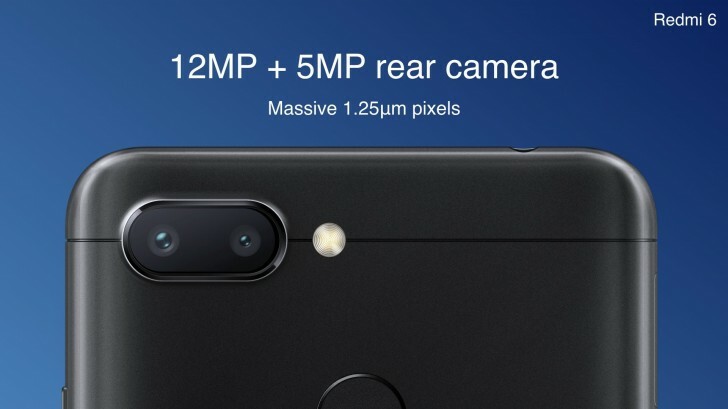 The camera setup is the same as the one present in the standard Redmi 6 - 12MP + 5MP on the back and a 5MP sensor on the front. All is powered by a big 4,000 mAh battery and according to Xiaomi, it can last for two days on a single charge. The OS is once again Android 8.1 Oreo + MIUI 9.6. 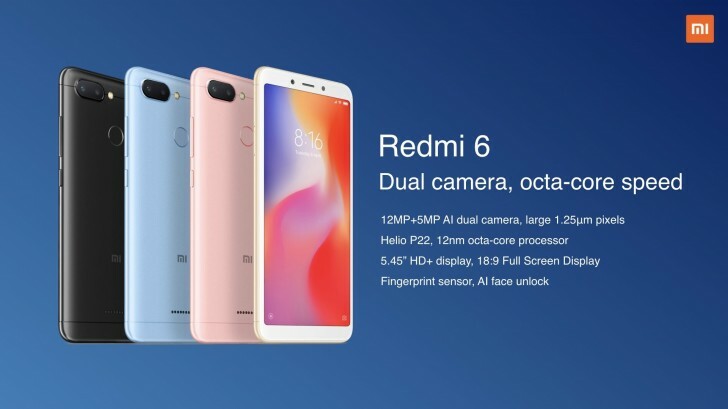 And finally, the Redmi 6A delivers similar user experience without missing on the AI-enhanced camera features on toned-down hardware and at a considerably lower price. It packs a Helio A22 chipset, comes in 2GB/16GB or 2GB/32GB flavors and sports a 5.45-inch display with the same HD+ resolution. 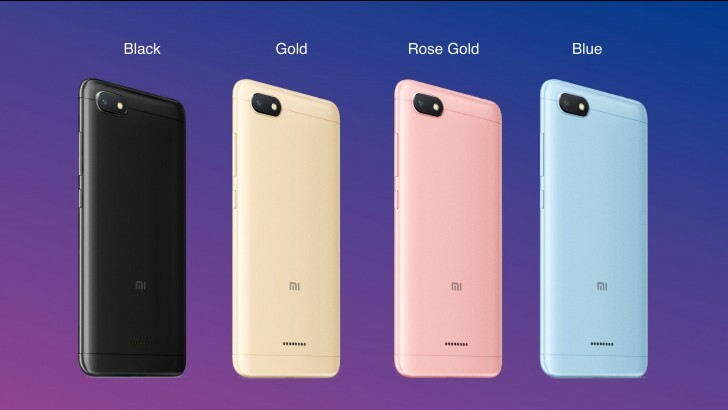 It borrows the original Redmi 6's display. The back houses just one 13MP camera while the front has a 5MP sensor for selfies and video chats. Battery capacity and OS configuration is the same - 3,000 mAh and Android 8.1 Oreo + MIUI 9.6 out of the box. However, the 6A doesn't have a fingerprint reader like the other two Redmis, so you have to rely only on the face unlock. Xiaomi promises a swift update to the newest MIUI 10 for the new trio. When it comes to pricing and availability, all three phones are priced aggressively as pretty much all phones from the company. 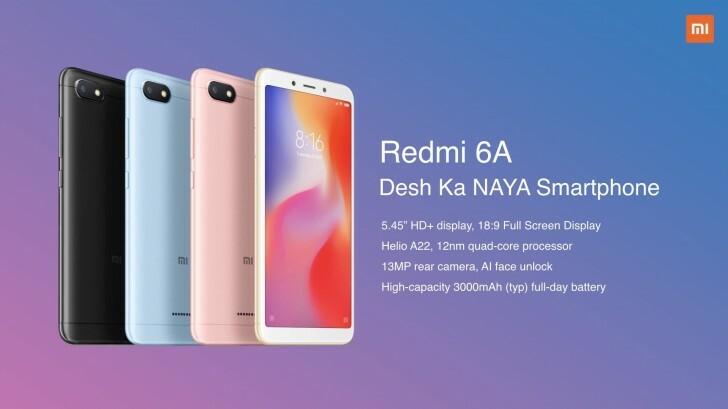 The Redmi 6A is expected to arrive on September 12 with a starting price of INR 5,999 ($83) for the 16GB model and INR 6,999 ($97) for the 32GB variant. The standard Redmi 6 will arrive on September 10 priced at INR 7,999 ($111) for the 32GB model and INR 9,499 ($132) for the 64GB configuration. 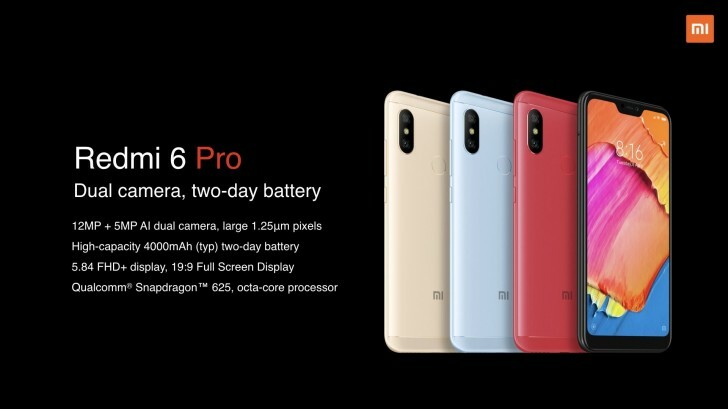 Finally, the Redmi 6 Pro sales kick off on September 11 at INR 10,999 ($152) for the 3GB/32GB model and INR 12,999 ($181) for the 4GB/64GB alteration. All handsets will make it to Xiaomi's official Indian offline and online stores with various EMI offers. Yesterday, they introduce redmi 6, redmi 6a, and mi tv 4a 32" to indonesia.. Agreed with U, the MIUI or any other skin UI is never better than stock/vanilla Android. Stock/vanilla Android is the best of the best OS U can deserve.